Most everyone has heard the name Huckins, but few know the company's history or even its location. 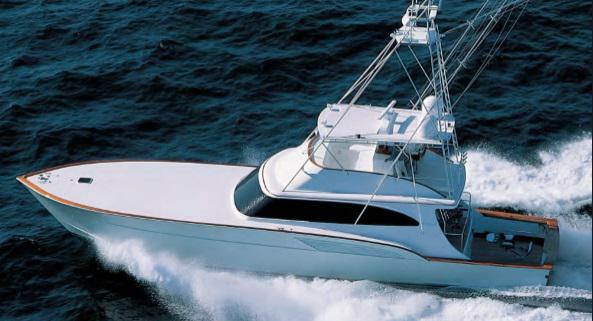 Jacksonville, Florida-based Huckins (founded there in 1928) claims responsibility for building the first mega-sport-fisherman - an 80-footer - back in 1969. It met with great skepticism, and not a single magazine spoke of it, as it was considered "way too large to be an effective sport-fishing boat" - the perils of being too progressive. Traditionally, Huckins boats were easy to pick out of a crowded marina. The flybridge sloped down to a horizontal cabin-top deck that stretched forward, eventually dropping down to the foredeck. But Rae Jean, Huckins' newest hull, leaves the old lines behind, adopting the same flush-foredeck lines as other modern convertibles. Designed by Gil Norush, the 70-foot Rae Jean really only differs from traditional Huckins yachts from the deck up. Norush employed the proven Huckins' Quadraconic hull design, which produces virtually no bow rise coming up onto plane. A very defined, sharp entry evolves into concave sections for most of the length until you get near the stern, where fairly flat aft sections end in a 7-degree deadrise. Huckins was one of the first companies to go to an all-cored construction, today using Corecell, vinylester resins and E-glass. Looking at Rae Jean from head-on you see a moderate flare: more than a Merritt or Rybovich but less than a Carolina boat. She remains remarkably dry even given the stiff winter winds that blow during the Florida sailfish season. This is likely due in great part to the substantial add-on (as opposed to molded-in) spray rail that runs from just aft of the stem and then angles down along the chine for much of the length of the boat. The Huckins 70 runs at a mere 3 degrees of incline, pretty much eliminating the need for trim tabs. This also makes for a more fuel-efficient ride and better speed, since it means you're sliding a flat panel over the surface rather than trying to push it through the water on an angle. The Huckins comes equipped with the new 12-cylinder Caterpillar 3412s producing 1,250 hp each. Top speed runs 31 knots with a cruise of 28 knots. Despite the deep, dark tones of the gorgeous, solid mahogany and holly trim everywhere, the salon strikes you as amazingly light. Though the windows don't seem any larger than average, the space seems much brighter than in similar boats. The most unique salon feature has to be a dumbwaiter that drops out of the overhead in the galley and rises to one of the forward cabinets of the flybridge coaming. Serving lunch on the flybridge will never be easier. Belowdecks, a three-cabin layout provides a private head with shower for each stateroom. The salon sports a wraparound galley forward portside, replete with convection oven, microwave, lots of storage, a huge stainless-steel upright refrigerator/ freezer, nicely curved bar with marble countertop and a built-in Gaggenau grill. Two comfortable swivel chairs on the "balcony" overlook the large cockpit. This balcony gives those with no clue about fishing a place to sit and watch without taking up valuable workspace from the anglers and crew. On the flybridge an overhead instrument box stretches across two-thirds the width of the hardtop. The helm console allows comfortable scanning of all instrumentation, an excellent view of both bow and cockpit and affords enough room to walk everywhere, even behind the helm and companion seats. An oversized overhang assures shade on the forward end of the pit where everyone sits. Full article here at MarlinMag.com.